Leaky gut syndrome, rarely recognized by conventional physicians, affects the lining of the intestines. 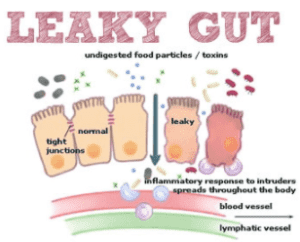 Leaky gut syndrome also known as increased intestinal permeability, is the result of damage to the intestinal lining, making it less able to protect the internal environment as well as to filter needed nutrients and other biological substances. As a consequence, some bacteria and their toxins, incompletely digested proteins and fats, and waste not normally absorbed may “leak” out of the intestines into the blood stream. This triggers an autoimmune reaction, which can lead to gastrointestinal problems such as abdominal bloating, excessive gas and cramps, fatigue/chronic fatigue, food sensitivities, joint pain, skin rashes, and autoimmunity. 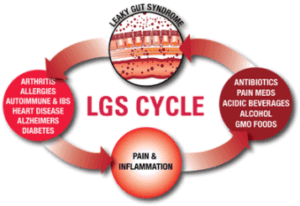 Leaky gut syndrome let untreated may trigger or worsen such disorders as Crohn’s disease, Celiac disease, Rheumatoid Arthritis, and Asthma. Can you seal and heal a leaky gut? YES! One thing you can do to heal a leaky gut is taking glutamine. Glutamine, also known as L-glutamine, is an amazing amino acid that has the ability to heal soft tissue like the lining of your intestines. Combine the L-Glutamine with Aloe Vera, Marshmallow Extract (root), Slippery Elm Extract (bark), and MSM (methylsulfonylmethane). We use a great product in our office that contains all of these! Take a probiotic. Probiotics are full of good bacteria which will help to restore the balance of your gut flora. You want to have more good than bad bacteria in your gut. Increase fermented foods like sauerkraut, which help balance your gut flora out. Decrease any infection load you may have in your gut – parasites, bacteria, and fungus. Most importantly cut out inflammatory foods in order to allow the gut to heal. Increase anti-inflammatory foods such as Omega. Omega-3is known for its ability to combat inflammation. You can increase the amount of omega-3 in your diet by eating more fatty fish like salmon, or by taking a fish oil supplement. In our opinion, leaky gut is a huge issue that the conventional medical community seems to ignore. As holistic doctors, one of the first things we focus on with clients is healing the gut! All immunity depends on good gut health. Luckily, we have a great program to do this. Now that you know what leaky gut is, if you feel you may have it we can help you restore balance to the gut in order to heal.